During a performance of Disney's "The Lion King" at the Blaisdell Concert Hall, Mufasa (Geno Segers), left, and Simba (Trevor Jackson) perform "They Live in You." Thirteen weeks. About 188,000 theatergoers. Roughly $45 million in estimated revenue for the local economy. Mayor Mufi Hannemann was one happy man at yesterday's press conference at Honolulu Hale when the final tallies were announced for Disney's "The Lion King's" record-breaking run at the Blaisdell Concert Hall. With cast members Geno Segers and Rudy Roberson in attendance, along with show presenter Jack Lucas, president of WestCoast Entertainment of Spokane, Wash., the mayor said the show, which ends tomorrow, "captivated the state of Hawaii and transformed the concert hall into a world-class venue." 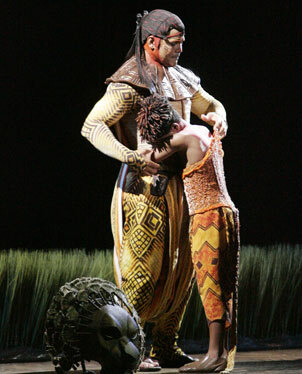 Lucas said that when the "Lion King" run was extended after ticket sales tallied 95 percent for the show's first six weeks, he admitted being a bit nervous. But he said that after Sunday's final show, tickets sold would end up 93 percent for the entire run. "This is unprecedented," he said. "Many national tours of Broadway shows don't even come close to this number." About 188,000 people will have seen Disney's "The Lion King," grossing more than $14.8 million. Knowing that the typical touring Broadway show produces at least $3 in local revenue for every dollar spent, Lucas said, conservatively, close to $45 million was made for the state. The mayor was also appreciative that the musical's cast members "took time out to visit schools and interact with our people and eat our local food," to which Segers, a former rugby player, responded with a satisfied, "Yeah!" In their comments at the press conference, Segers, Roberson and Lucas were genuinely touched by the response to the show. "The show was so warmly accepted, it was a personal experience I'm not soon to forget," Segers said. The North Carolina native added, "During the first four weeks of the run, people would ask me, 'Are you local?' and I would say, 'No.' Now, when I'm asked that, I have to think again. I may not be from Hawaii physically, but I am now from Hawaii spiritually and I'm honored to be part of the community." "This has been one of the most amazing experiences of my life," said Roberson. "The people of Hawaii are off the charts. There's so much here, the spirit. ... To say it's been great would be an understatement." And in relation to local sports, the mayor also mentioned that several players from the University of Hawaii Warrior football team will be grand marshals at this evening's Kapolei City Lights electric light parade, where they will help light the Kapolei Hale Christmas tree at 7:30 p.m. He also said that Leilehua High School will get its own parade of champions down California Avenue at 2 p.m. Dec. 15 to honor the school's state champion football and cross-country teams. And, like Gov. Linda Lingle's challenge to Georgia Gov. Sonny Perdue, the mayor offered a similar pineapples-and-peaches challenge to Mayor Heidi Davison of Athens, home of the University of Georgia campus, over the outcome of the Jan. 1 Sugar Bowl. "I guarantee that we will go 13 and 0," the mayor said, "and the sugar will taste especially sweet."